We bought this Chicco Travel System before Lucas was born. 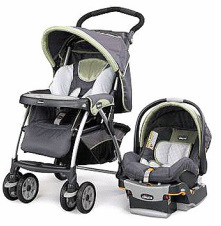 The set comes with an infant car seat, one base, and the stroller. It was extremely useful when Lucas was a baby, although I wish we'd utilized the stroller more for it's carseat carrying ability. Now that Lucas is older and bigger, we use the stroller regularly. It's great for napping on-the-go, and very durable. It's a little on the pricey side, but well worth every penny. I've had may other friends who purchase less expensive travel systems, which break after less than a year of use. This ERGObaby Carrier has been, BY FAR, the best thing I've owned as a mom (aside from diapers, of course). While it was a bit of an investment (around $115 at Babies R Us), it has been worth more than the price on any tag. I take it with me everywhere, and it has been instrumental in allowing me to have the freedom to get stuff done. If you've ever experienced one of those days where your kid just wants to be near you, then this is the best solution I've found. It's made of comfortable, cloth materials, and securely (but comfortably!) attaches your baby to you. It can be worn in the front, on the back, and even as a hip-carry. The sleeping hood is excellent, and the available accessories make it even more convenient. Seriously, though, if you're considering baby wearing as part of your parenting style, this is the best, most comfortable, durable baby carrier on the market. TRUST ME, it's worth the money. 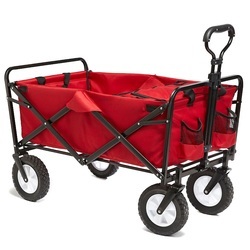 Just scored Lucas this MAC Sports Foldable Wagon from Sam's Club for about $56.00, and he absolutely loves it! Now that he's a "big boy" he no longer enjoys riding in the stroller (which I don't mind, because that thing, although awesome, is HUGE! ), and needs more space. With our teeny apartment, we needed something compact, and this is it! Because we travel so much, Lucas also needs a place to sleep while we're at competitions and visiting places that can't accomodate a pack-n-play. This is an awesome solution! It folds up to only 8-inches thick, and is more compact than you'd imagine. It opens and closes in less than a second (I'm not exaggerating here, people! ), and is very sturdy. The handle extends and also serves as a way to tow the collapsed wagon. It also comes with a handy-dandy storage bag and wipes clean in a jiffy!